Miguel was very flexible and put together a great visit. Very knowledgeable and courteous. Took us to some very nice wine tastings. Highly recommend. TOUR GUIDE RESPONSE: Thanks for your comments, it was great to host you here! Obrigado! TOUR GUIDE RESPONSE: I am glad that you got to experience the Douro Valley, thanks for your booking and comments, I appreciate it. Muito obrigado! Miguel is awesome, bottom line. This tour was the highlight of our trip. He went above and beyond to make sure we got to see all we wanted. He is so knowledgeable on Portuguese history. We felt we were traveling with a friend. Do yourselves a favor and book this! Miguel was fantastic. We modified this tour by going to Lamego after visiting Amarante. So much to see in this small city. Could not have done this on our own as 1 chapel was closed upon arrival & the other way out of town. He found a way to get us into the "closed chapel" which was beautiful. Climbing the steps of Santuario Dos Remedios was a treat. He even took us to the birthplace of Magellan when he discovered our interest. Mateus Palace ended a great day. Book with Miguel. Miguel provide my group of 18 people with an outstanding tour. Our journey from Porto to Lisboa with stops in Aveiro and Fatima plus his luncheon arrangements far exceeded our expectations. His knowledge, his patience, his clear and informative narrations, his enthusiasm and his engaging personality made this excursions one of the absolute highlights of our 2 1/2 week adventure. We would recommend him highly to anyone planning to visit this part of Portugal. Miguel, thank you for a fascinating day trip to Coimbra and Aveiro. Your knowledge of the history of Coimbra was wonderful and I would definitely recommend you. You chose an excellent restaurant for us in Aveiro for lunch - one typical of the region rather than touristey! I have used other ToursByLocal guides and they have been good, but our experience with Miguel took it to an entirely new level. His love and passion for the history, culture and beauty of Portugal shines through. From the small local restaurants with incredible food to and amazing wineries with breath taking views in the Douro, Miguel helped us put together a trip where we felt like family. Truly a trip of a lifetime. We engaged Miguel for five and one days. We had him create a custom itinerary for all 5 days. He was very good communicating with us by email in advance. Executed tours beautifully modifying the days based on crowds, traffic, and weather to optimize our time. One of the best guides we have had three years and 20 plus guides. TOUR GUIDE RESPONSE: Muito obrigada! TOUR GUIDE RESPONSE: I appreciate your rating, many thanks! We engaged Miguel for six days, having him meet us in three ports. We had some specific request. Through several emails he put together what we wanted. The days were well spent he changed the itinerary at the drop of a hat to capitalize on weather or avoid crowds. With many tours by locals over the past three years he is one on the best we've had. TOUR GUIDE RESPONSE: A magical day in Sintra and along the coast! Obrigado. TOUR GUIDE RESPONSE: Thanks for letting me show you the capital, a wonderful day! TOUR GUIDE RESPONSE: I appreciate your rating and comments. Obrigado! TOUR GUIDE RESPONSE: Thank you, a great time! Miguel was one of the best guides we had on our recent visit to Bordeaux and the Douro Valley. His love and knowledge of the area was amazing. The lunch with wine pairing he arranged for us was delicious and jaw dropping gorgeous . He was the epitome of what every tour guide should be. Abrigado for a wonderful day in Portugal. We will return and for sure use Miguel again. Miguel was a great guide and fun to be with. He met us in Lisbon and drove us to Porto visiting Coimbra and Aveiro where we had lunch. His knowledge of Portuguese history was exceptional. He spent the next three days with us visiting the beautiful Douro Valley,where we had an exceptional lunch at a winery, visited Guimaraes, wandered the streets of Porto, and ate at great restaurants. Miguel went out of his way to make sure we saw everything we wished and to made our tours as easy on us possible. TOUR GUIDE RESPONSE: Thank you for your rating, I appreciate it! We had a fabulous day with Miguel touring the Douro Valley. He was a fountain of interesting information, enjoyable company, personable, well-spoken and flexible and adaptable with our plans/interests. Jennifer, who helps organize his tours is prompt and thorough - a great team. You won't be disappointed! We thoroughly enjoyed our trip to the Douro Valley with wine tasting and lunch. Miguel is an excellent guide, very knowledgeable and approachable. The Douro valley is one of the most beautiful places on earth for scenic views and friendly people. We are a group of 6 friends traveling together. Miguel was great. He was very informative & helped us get the most out of our time in Sintra & Cascais. We would gladly use him again & recommend him highly. TOUR GUIDE RESPONSE: It was a pleasure to host you, thanks for your comments and rating. All the best! Miguel was an excellent guide and driver and knew Portugal very well. We thoroughly enjoyed our tour and Miguel's company. TOUR GUIDE RESPONSE: Thanks for your comments, it was great to host you on this tour transfer. Obrigado! Since five is the highest, that's our rating. We would all rate him higher. TOUR GUIDE RESPONSE: That's very kind, thank you! It was a pleasure. VERY knowledgeable, helpful, accommodating and pleasant. Nothing negative to say about him. TOUR GUIDE RESPONSE: Thank you for your comments and rating, it was great to host you! Excellent tour! We were picked up in Obidos and stopped in several towns along the way. Once in Porto we ate a restaurant that was more for locals...absolutely the best seafood we have ever had. Miguel was very knowledable and it felt like we were traveling with a close friend. Highly recommend him if your traveling to Porto. TOUR GUIDE RESPONSE: Thank you for your comments, the feeling was mutual! I was a pleasure to host you on this tour. Obrigado! Miguel was simply outstanding. He took a party of 3 of us and adapted to our needs. Being the one Jewish guest, he was able to provide me with an unbelievable history lesson. In fact, he had a tremendous knowledge of portuguese history. He also took us to 3 great vineyards, including one very small and exceptional port maker. Could not ask for a better visit. Miguel was amazing, he took us to Nazare, Obidos and Aveiro on our way to Lisbon. He gave us great insight into the country's history and took us to a wonderful, local restaurant in Obidos. I would highly recommend Miguel to anyone looking for a guide in Portugal. Miguel was able to customize an excellent tour for us to our specifications, and on fairly short notice. The price charged was fair, given the extent and duratin of the tour. Miguel was a gentleman throughout, and provided us with excellent guidance, selecting wonderul local options and providing knowledgeable narration and insight throughout the tour. His driving was excellent, along with his familiarity with local traffic patterns. Highly recommended! TOUR GUIDE RESPONSE: It was a pleasure to host you here. Thank you for your kind comments and rating. All the best! Obrigado. TOUR GUIDE RESPONSE: Thank you for your rating, it was great to host you! Miguel was a great tour guide! He was prompt and professional from the start. He gave us a great history of both Porto and Portugal, which was so helpful since it was our first day in country. He catered to our needs and wishes, but also was able to adlib as needed to create a great trip and experience. I would highly recommend hiring Miguel for any of your tour needs. Miguel was wonderful! He clearly loves Porto and wants nothing more than to have you fall in love with Porto as well. He has a deep knowledge of Porto's history and shared it richly with us. He was very aware of our family's diverse interests and needs and went out of his way to make sure everyone enjoyed themselves. He was nothing short of delightful! I can not say enough good things about Miguel and this experience. After spending 6 hours exploring Porto I has a real feel for all parts of the city, its history, the people and culture. Miguel is extremely knowledgeable passionate and just a great person to spend time with while experiencing Porto. My only regret is not allowing sufficient time in my itinerary to all for an extra night to have Miguel show me the Douro Valley. TOUR GUIDE RESPONSE: There is always next time! I look forward it it. It was great to show you around. Obrigado! Our tour with Miguel was a highlight of our time in Porto. He took us to fantastic wineries, we had a perfect vineyard picnic, and douro river cruise. Miguel was the perfect balance between tour guide and friend! Even our daughters ages 6 and 8 thought he was a fun friend to hang with for the day! TOUR GUIDE RESPONSE: It was a great to hang with your family too, a great time for me! Thanks for your kind comments and rating. All the best, hi to your girls! Obrigado! TOUR GUIDE RESPONSE: Thanks for your rating, I appreciate it! Obrigado. TOUR GUIDE RESPONSE: Thank you for your kind comments (as noted below) and rating. It was a pleasure to host you! Miguel "my husband and i both highly recommend this tour with miguel. he was punctual, his english is excellent, he is extremely knowledgeable about history of portugal, and clearly enjoyed sharing his love of the country." TOUR GUIDE RESPONSE: Thank you for your comments and rating, I appreciate it and had a great time hosting you both. All the best! Miguel was superb Put together a high end wine tour that exceeded our expectations Very broad knowledge Will plan to use his services again!!! Miguel was great Very knowledgeable and personable Willing to make last minute changes for the 6 of us Would highly recommend and plan to use him again!!! Miguel was extremely knowledgable about Porto and specifically the history and significance of the past as it relates to the present. He was considerate of pacing and time and flexible with our needs (we were fortunate to have him dedicated to the two of us). His communication was excellent and we packed a lot in in 3 hours. TOUR GUIDE RESPONSE: Thank you for your comments, I enjoyed hosting you here! Obrigado! Excellent> just completed a 12 hour tour of Porto inclusive of the Douro Valley and region around. So much done in one day yet it was all manageable and enjoyable. Miguel was totally organized to make sure I maximized the day, and the unique areas he showed me in Porto made me wondering about doing another trip sooner then later. Speaks excellent English and knows the history and unique details of area that brought the trip alive. A brilliant day with Miguel, we would highly recommended his tour to any wine enthusiast or anyone wanting to learn about the wines of Portugal. For the second year running, we enjoyed an exceptional day with Miguel. He is knowledgeable, accommodating and like being with someone you've known a long time. It was such a pleasureable day - we only hope for the opportunity to return to Portugal if, for no other reason, to spend more time with Miguel. Many, many thanks!! Miguel is a professional engaging guide & driver. His English is excellent & he is a great storyteller w/a true passion for Portugal. His profound knowledge of history, culture, food & hidden gems made for interesting transfers. NEVER rushed, covering tremendous ground efficiently and w/the fewest crowds. We saw more than we would have seen on our own. He was very flexible and patient as we stopped to take MANY photos. Obrigados to our personal photog & extraordinary guide-now we are In photos together! TOUR GUIDE RESPONSE: Thanks again, really a pleasure having you here! TOUR GUIDE RESPONSE: Muito obrigado! TOUR GUIDE RESPONSE: Another great day, and pictures! TOUR GUIDE RESPONSE: Thanks for the great time! TOUR GUIDE RESPONSE: Thank you! It was an adventure full of good things. TOUR GUIDE RESPONSE: Thank you so much for your kind words, it was amazing to host you on this journey. Lots of great memories by all! Miguel was our guide for a day in the Douro Valley. Miguel's vehicle was clean and comfortable and he shared his knowledge about the wine industry, Portuguese history and current events, and information about the Douro Valley. Some highlights of the day were our delicious, relaxed lunch in Pinhao, a visit to the Saturday market in Amarante, stunning views of the terraced grapevines rising above the Douro, and 2 stops for wine and port tasting. We would highly recommend Miguel's tours. Great tour. Picked up at Porto and dropped off in Lisbon with stops at few places of our choice. Great value and convenience. Miguel is awesome, knowledgeable and funny. Never rushed as so we could enjoy places. Highly recommend if you are planing to visit Lisbon and Porto during same trip. TOUR GUIDE RESPONSE: Thank you so much, it was a pleasure! Greatest tour. Beautiful area. Miguel is awesome, knowledgeable and funny. Never rushed as so we could enjoy our time. Highly recommend. TOUR GUIDE RESPONSE: Another great day! Muito obrigado! Great tour. Picked up at airport in Lisbon and dropped off in Porto with stops at few places of our choice. Great value and convenience. Miguel is awesome, knowledgeable and funny. Never rush as so we could enjoy places. Highly recommend if you are planing to visit Lisbon and Porto during same trip. TOUR GUIDE RESPONSE: Obrigado for your rating and comments. It was great to welcome you here and take you to your destination, with lots of fun along the way! Take care! TOUR GUIDE RESPONSE: Thank you for your rating, I appreciate it and hosting you to the gorgeous Douro Valley! Obrigado! Our tour with Miguel was outstanding. He was an excellent guide and tailored the trip to our interests. He was prompt, professional, spoke excellent English and was very personable. His knowledge of the history and culture made the trip much more interesting than simply being driven from one location to the other. Highly recommended. TOUR GUIDE RESPONSE: I really appreciate your kind comments. It was a true pleasure to host you. Muito obrigado! TOUR GUIDE RESPONSE: It was a great day, thank you for your booking and allowing me to show you the best of Porto. All the best, Miguel Obrigado! Miguel is an amazing guide! 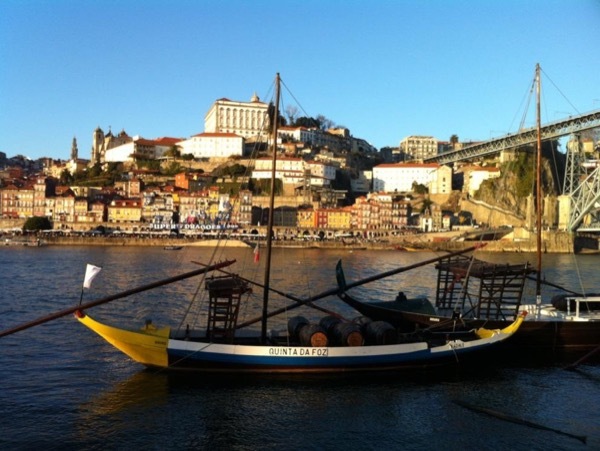 We were flying into Lisbon but spending the first part of our stay in Porto, so this transfer directly from the Lisbon airport all the way to Porto was a great alternative to a train ride. Plus, we stopped in towns that we would have missed otherwise, including the legendary university at Coimbra. Miguel joined us for lunch in Coimbra for our first meal in Portugal, showing us important dishes and dining traditions. We were jet lagged & tired but Miguel made it an amazing day! TOUR GUIDE RESPONSE: It was a great day! Thanks for your appreciation, it was my pleasure. Obrigado! Miguel is a seriously well informed, professional guide and we had a terrific day with him in Porto. We have used ToursByLocals many, many times and Miguel was certainly among the best of our guides. TOUR GUIDE RESPONSE: Thank you for your kind comments and rating, it was a pleasure to host you here! All the best, obrigado! TOUR GUIDE RESPONSE: Thank you for your rating, I appreciate it! It was a pleasure to host you here. Miguel was very knowledgeable and flexible and we enjoyed our tour and lunch with him. We saw aspects of Porto we would never have seen for ourselves. TOUR GUIDE RESPONSE: Obrigado! I am glad that you enjoyed your time here. All the best! Miguel is an excellent guide, very knowledgeable and helpful. To a large degree we planned our tour to the Douro Valley on an instantaneous basis and Miguel was both helpful with a range of suggestions and flexible. Simply the best ... Sintra came alive with his stories. Book Miguel for all your time in the Lisboa area, you shall never regret that decision ... it might take a little while to loss the extra pounds from the great restaurants he knows, and the owners know him! Had a wonderful day with Miguel in Lisbon. We saw many sites in a very time efficient manner. He knew all the tricks to avoid long ques and we were able to see 4 times what we would have seen on ships excursion. He was able to suggest and taylor stops to our liking. Highly recommend him and would use him in all the ports he works in. TOUR GUIDE RESPONSE: Thanks for your kind comments, it was great to host you! All the best and until next time... Obrigado! We had a fantastic tour to the Douro Valley with Miguel R. He is a very knowledgable and engaging guide and we really enjoyed our day with him. He showed us beautiful scenery, shared historical and current information, arranged a lovely gourmet lunch with wine pairings, a boat tour on the Douro Valley etc., and more port wine tastings! He catered the tour specifically to our needs and interests and shared his love of this beautiful region with us. We highly recommend him! TOUR GUIDE RESPONSE: Thank you for your kind rating and comments, it was great to host you here and allow you to experience this amazing region. Take care! TOUR GUIDE RESPONSE: Thanks for your comments, it was my pleasure. TOUR GUIDE RESPONSE: Obrigado! Really great to host you on this tour. All the best! Our tour with Miguel was perfect. He and his driver picked up 9 of us at our rented apartment in Porto and dropped us off at our rented apartment in Lisbon. Along the way he guided us through Aveiro and Fatima. Upon our request, he brought to a small chapel right on the beach a few miles from Porto. Allowing us to customize our tour and by having it private for just our family was what made this tour/transfer extra special. Miguel was very informative and patient allowing us to take many many pictures. TOUR GUIDE RESPONSE: It was a pleasure to host you and thank you for being so open to experiencing it all! I look forward to next time. Muito obrigado! Joel, Miguel's compatriot, was delightful! An effective and personable communicator with a great sense of humor. He was very knowledgeable of all areas, a very good driver and took us for a wonderful, authentic lunch. Wish we had had more time to see Lisbon! TOUR GUIDE RESPONSE: We are thrilled that you had such a great time, it was a pleasure to host you! All the best. Obrigado. Miguel was a great host - met us right on time at the cruise port, very well informed on the locations that we visited and a very conscientious driver. I would highly recommend Miguel to anyone visiting La Coruna. Miguel is charming and very knowledgeable. Great day and a wonderful pace. Thanks again! This was a fairly long but absolutely lovely (and uncrowded) day. Miguel selected wineries to suit our tastes and interests, as his background makes him especially knowledgeable in this area. We appreciated his skillful (and sober) driving, his helpful commentary, and friendly, considerate manner. A lovely lunch with spectacular view, as well! The four of us were very happy with our experience provided by Miguel. He was very pleasant, very fluent in English and provided a great representation of the Porto area in the limited time we had in Port. We only wish we had known he could possibly have been available for touring us in Lisbon as well. We all send a thank you to Miguel. We hope to return and see more of your country! Miguel was one of our favorite guides on our grand Iberian adventure! He is very articulate and has excellent command of the English language and a true passion for his country. We did the 4 hour walking tour with bridge view boat ride. Wish we had more time in the Oporto area and will definitely book with Miguel again when we come back to the area. Though we had read about Santiago Compostela, actually seeing it was wonderfully startling. Miguel Ribeiro picked us up at our cruise dock and on the hour+ ride to San..Com.. we were given extensive information about the area, the history and what we were to see. Even though there were HUGE crowds Miguel managed to see that we were always in the right place to fully take in the event. We were totally impressed with the tour and with the expertise and knowledge of Miguel. Miguel was on time and very professional. His transportation was very comfortable. He had a good level of knowledge of the Porto history. It was a very enjoyable tour. This was the second day of our private tour with Miguel and he was on time to collect us from our hotel in Sintra and take us to the Palace, parking close by so we could beat the crowds. Miguel explained all parts of the Palace and we could keep moving at a good pace. Miguel then gave us a scenic coastal tour into Lisbon for coffee and pastries at the famous "Pasteis de Belém". A tour of St Jerome's monastery and the waterfront. Dropping us off at hotel after showing where we can shop the next day. TOUR GUIDE RESPONSE: It was a pleasure, thank you. Muito obrigado! Miguel did a fantastic job. His English was excellent and we enjoyed listening to his knowledge of all parts of country from Porto to Sintra. He took us to the places we wanted to see and managed to park very close to the venues. He drove safely and had a comfortable vehicle. Certainly recommend Miguel to anyone wanting a private tour. TOUR GUIDE RESPONSE: I appreciate your rating and comments. I really enjoyed hosting you here, obrigado. All the best!